Even if you’ve never been to London, you’ve probably heard of Camden or seen photos of it: a rock and roll celeb favourite with a world-famous vintage clothing and food market, riverside pubs and beer gardens and lots of live music venues dotted throughout. This area is actually called Camden Town, but usually shortened to just Camden, and is one of the 35 major centres of administration named in the London Plan. Just over 25,000 live here. HFS London loves the originality and edgy feel of Camden, and have homestay properties in the area ready and waiting for students and work visitors to stay within. 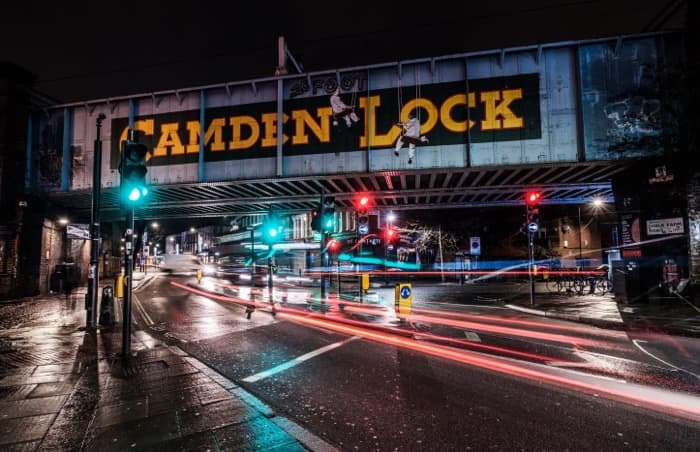 This guide will help you decide if Camden is for you, and if so, you can get in touch with the HFS London team and talk options and booking! Camden is located approximately two and a half miles north of Charing Cross, and sits within postcode regions NW1 and NW5. It sits to the south of Belsize Park and Chalk Farm, west of Barnsbury and Kings Cross, north of Regent’s Park and east to South Hampstead. It’s proximity to many other popular areas of the capital means that it’s well connected and usually busy for residents and visitors alike. What’s the typical accommodation type in Camden? A whirlwind visit to Camden town will display primarily brightly-coloured and graffitied shopfronts, but there’s much more to property in this neighbourhood than first impressions may reveal. There are roads full of Georgian and Victorian townhouses, typical to London, both converted into flats and left unconverted as family homes. Many are painted in bright hues or pastels (this is Camden, after all! ), to add a touch of colour to the streets. There are some estates of council housing, as well as lots of property conversions to flats from old warehouses, breweries and industrial spaces. There is also some new build developments of flats and homes, but not too many; the most recent is Hawley Wharf, which sits where part of Camden Market was irreparably damaged by fire. The popularity of Camden means that you’ll find other people on the streets pretty much all of the time; so you’ll rarely be alone, although many may be visitors, so you could struggle if asking for directions! Camden is perfectly safe and the media’s inflated crime rates and headlines are only as a result of the number of tourists in the area, which always results in a degree of petty crime. What type of people live in Camden? It’s difficult to pigeonhole Camden’s residents, as there’s such a diverse and broad spectrum of people living in the area. There are still families residing here, and it is still possible to get affordable housing in the neighbourhood, although it’s few and far between. Lots of young people, young professionals and international visitors reside here, and the vibe is definitely artsy, alternative and friendly. Notable residents past and present include Amy Winehouse, Alan Bennett and even Charles Dickens! What transport links does Camden offer? Camden is extremely well connected and so you won’t struggle to get around. Two branches of the London Underground’s Northern line call at Camden Town station, as well as the Overground at Camden Road. Perhaps easier, the town is less than a 20-minute walk from King’s Cross, which houses international transport links. There’s numerous bus routes running through Camden, including night buses, and plenty of private transport options too (although roads do get busy at weekends and during rush hour, so we wouldn’t recommend driving unless you have to!). What is there to do in Camden? It’s not by a whim that Camden is a London tourist hotspot, and there’s no chance here that you’d run out of things to do or see! Camden Market is world-renowned and worth popping by when you’re in town. There are hundreds of stalls and shops selling vintage clothing, alternative clothing and food from around the world. It’s easy to lose a whole day trying on flashy accessories and getting lost in the rabbit hole of stalls and excitement. There’s also plenty of places to stop for a drink and food when you need a rest to re-fuel and then go again! Regent’s Canal runs right through the middle of Camden, and there’s numerous canal boat trips along it to see the area from a new perspective, and to explore a little further afield. There’s lots of different companies offering similar tours, so compare and contrast offers to find a good deal. The spiritual home of punk and rock ‘n roll, Camden houses loads of live music venues including the infamous Roundhouse. Big gigs will need to booked in advance but lots of local pubs offer live music for free, and so there’s plenty of genres and new experiences to be had even if you don’t want to spend lots on pricy tickets. If you are an international student, intern or professional looking for homestay (“host family”) accommodation in Camden or close by, we would love to hear from you. Similarly, if you have a spare room in your Camden home and are interested in hosting international students, please do get in touch with us.